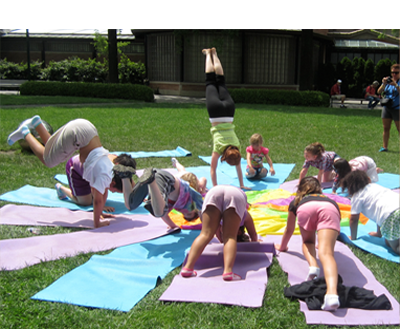 Is there a difference between yoga for kids and traditional yoga for adults? While we incorporate many of the traditional aspects of adult yoga, such as chanting, pranayama (breathing), vinyasa (flow) sequences and savasana (relaxation period), the Lil' Yogis NYC program was designed to be more free and fun than the typical traditional adult yoga class. In particular, our curriculum incorporates interactive games, creative movements, songs and props to create a lively environment that helps each child connect with the experience. How much time do you have? We jest because the truth is that the benefits of yoga are infinite. By combining flexibility, strength, balance and fun, our program's many benefits include physical health, a peaceful mind, and most importantly, joyful, playful self-expression for children. And best of all, (from one parent to another) our program emphasizes relaxation and promotes a sense of calm. What if my child isn't flexible? Just as with adults, it is important to recognize that yoga is not about how flexible you are. Instead, yoga is about strengthening your mind and body. And benefits can be achieved regardless of your child's level of flexibility. Do you have any more questions? Please let us know by clicking here!